My mother died in the mid 1980’s. Artwork that I was doing at the time was figurative; abstracting the human form to address social issues of the day . My favorite artists at that time were Susan Rothenberg, Mimmo Paladino, Rufino Tamayo. A few weeks after my mother’s funeral I started thinking about angels, thinking that maybe my Mom was now a guardian angle watching over me, and I started drawing and painting little wings on my otherwise earth-ridden people. I did several acrylic paintings with that same theme; one being a large piece, 6’x8′ , framed with a triangular pediment top . I wanted it to look like an altar piece. That painting moved from one apartment to another, one storage unit to another for several years and then I got my job at Edgewood College. 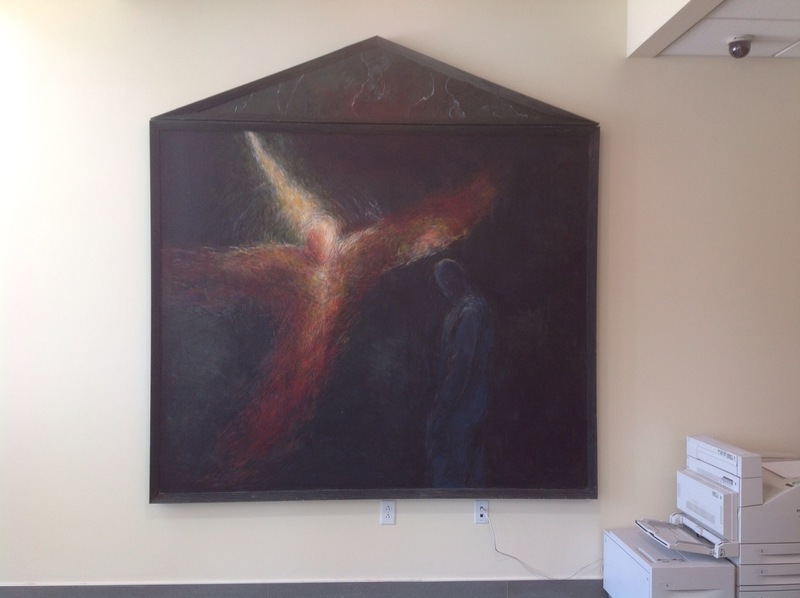 After teaching at Edgewood , a small , private Catholic college, and not wanting to see this huge painting done in honor of my Mom get damaged I got the great idea of donating the piece to the college. They accepted it and , it went in storage AGAIN ! A few more years went by and our new gallery director at the time, Paul, found it, took it out of storage and hung it in a small intimate space with a big empty wall in our new art building. It looked beautiful! Natural light from skylights let the “glow” show as it was intended. That gallery director left and we got a new one, David. He came to me one day and said the painting had to be moved again because the little room that it had been hanging in was being used for too many things and there wasn’t enough space. The painting might get damaged. A couple weeks later he told me it had been hung in the main entrance of the main building of the entire college! Well , there you go ! The painting finally has a permanent home…. 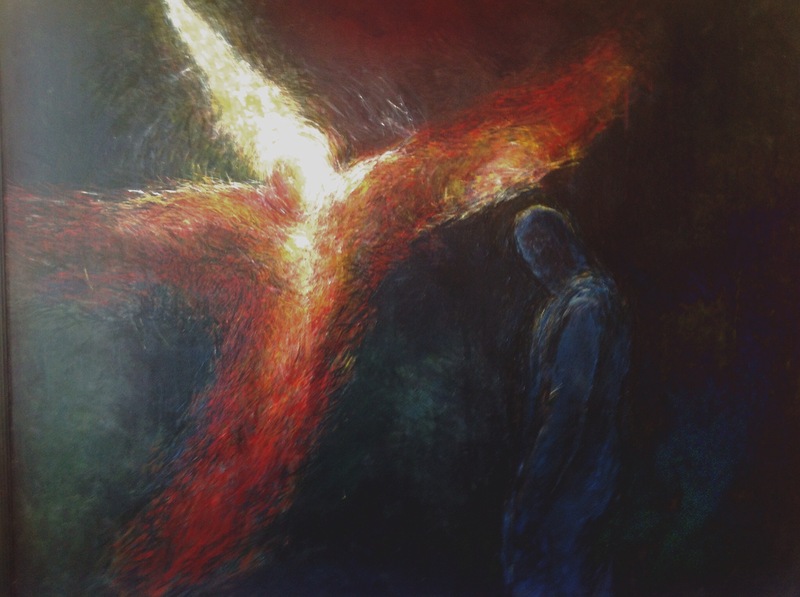 a spiritual painting welcoming people into the college. In honor of my Mom…. my memories of her are in that painting. I can hear her voice and her laugh, hear her playing her violin and the church organ, remember how she used to wake me up for school and then crawl into bed with me for a little while , making me feel safe and secure before getting up and getting ready for school. So , 25 years later , or more even , my Mom truly is my guardian angel….. there hanging on that wall , welcoming me every day.I know I can go visit her. She is there.